As they conquered their way through Europe, the Romans left behind a number of souvenirs, like the (still-standing) aqueducts that used to bring water to homes and businesses. But the Romans also established a system of sewers to dispose of, well, you know. The sewers consisted of a network of underground pipes that ran beneath houses and streets, and terminated at the nearest body of water. In fact, the word sewer derives from the English seaward. In medieval London, all sewers led to the river Thames. The Thames, of course, was also where drinking water came from. And where laundry was washed. So, just how did townspeople of the Middle Ages conduct their “business”? All homes had chamber pots, which were the preferred conveniences, particularly at night and in bad weather. In the morning, the contents were simply thrown out the window into the street. “Rakers,” or street cleaners, regularly swept the waste into the sewers, and from there to the river. The more fastidious citizens had privies and latrines, usually shared by several households. The rich, of course, had servants to empty chamber pots out the window. In rural areas, outhouses continued to be used well into modern times. Outside the capital, it was in monasteries that many advances in hygiene and sanitation were first developed. Although monks reputedly rejected worldly conveniences, the relatively large numbers of monks sharing communal living quarters created a need for efficient disposal of human waste. Most monasteries were situated near large bodies of water, and they employed a system of latrines that were periodically flushed by water under pressure from large, elevated cisterns. Unlike average citizens, monks didn’t use chamber pots. Only the very sick were exempt from the need to walk to the latrines, regardless of weather. There’s even strong evidence that some monks used thin, linen rags as primitive toilet paper. Castles, both in and out of London, weren’t much different from monasteries—except that their noble inhabitants demanded more creature comforts. Walk to the latrines in the cold night air? Not on your life. They used chamber pots in a pinch, but much preferred private toilets. These were similar in design to the monastic latrines, but they were often built into the castle walls—usually near a fireplace for cozy comfort. Since castle walls were usually several feet thick, it was no problem to carve out a small space, called a garderobe, (French for “clothes closet”), perfectly situated near milady or milord’s bedchamber. As in monasteries, these were periodically flushed by gravity’s pull on the castle’s drainage system. Ever stop to admire the serene, romantic look of the moat surrounding medieval castles? Well, here’s a dose of reality. Aside from their value as protection against enemies, moats also served a far more utilitarian function: the disposal of household waste. In castles that didn’t enjoy the luxury of flushing drains, privies were often cantilevered out over the moat. The city of London generously provided public latrines, conveniently situated near the Thames. In a lot of cases, the need for pipes was eliminated by simply building the privies on bridges. This greatly facilitated “dumping” into the river. As a result, navigating the Thames was a real challenge, especially when sailing under a bridge. People who lived too far away from the water used cesspits, big holes in the ground that stored the waste until they could be cleaned out, usually at night. The contents were then dumped (you guessed it) into the river. People sometimes went to great lengths to save a little money. Paul Newman’s book Daily Life in the Middle Ages recounts the story of one ingenious Londoner, who came up with a way to avoid the expense of building a proper cesspit. Instead, he ran a pipe from his privy to his neighbor’s cellar. The neighbor may have been particularly clueless, because the plan seems to have worked for quite a while. The neighbor only caught on when sewage completely filled the cellar and began seeping into his first-floor rooms. Predictably, the hapless neighbor sued. And it’s through the record of that lawsuit that we know of it today. To offset the expense of maintaining public toilets, city governments turned to a commercial practice known since Roman times. Urine was collected from latrines and sold to wool manufacturers. Urine contains ammonia, which is used to remove some of the natural oils in unprocessed fleece. Urine was also used in the tanning of leather. By the middle of the 14th century, London was a mess. The air was foul and the river flowed with sewage. Clothes washed in river water retained the odor of cesspools. Rats were thriving in the filth, and the plague was resurfacing. King Edward III, fresh from the Hundred Years’ War, turned his attention to the problem of the stench. He issued a proclamation specifically forbidding the dumping of “rubbish, earth, gravel, or dung from dwellings or stables” into the Thames. Instead, it was to be carted away by “dungboats” and disposed of outside the city. It didn’t take long for old habits to resurface. Two years after his decree, the king wrote the mayor of London, complaining that the streets of London were foul with human feces thrown from houses. Yet as awful as hygiene had been in medieval London, it was nothing compared to the state of sanitation in the 19th century. Despite various efforts at sanitary reform, Londoners kept reverting to their old habits. You’d have thought city dwellers would have learned their lesson about public health and sanitation—but you’d be wrong. For five centuries, things went from bad to worse. In the early 19th century the flush toilet was introduced. Of course, only the rich could afford them; and while they may have considered themselves better off with their new status symbols, they really weren’t. The newfangled flush toilets still dumped into the same sewers and still polluted the same water. As it turns out, the rich were no different than you or me—at least when it came to breathing. In 19th-century England, people flocked to the cities to take advantage of the Industrial Revolution (in which they themselves would be taken advantage of, but that’s another story). The sewers hadn’t been much improved since Roman times, when they were first built. By mid-century, two and a half million people were producing bodily waste. 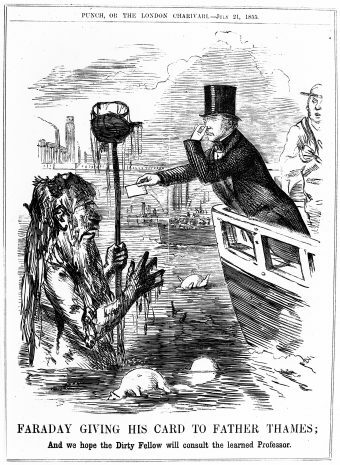 The city had taken on a decidedly odoriferous quality, and the river Thames had grown darker and ranker than ever. The summer of 1858 was unusually warm, and of course, the heat intensified the effect. Without air conditioning, windows of houses and businesses had to stay open, so there was no escape. The stench had become so powerful that Parliament had to close down. People hadn’t yet caught on to the germ theory of disease. They thought all sicknesses were caused by “bad air,” so they didn’t pay much attention to what they put in their mouths. Drinking water still came from the Thames, often just downstream of where the sewers let out. Eight glasses of water a day was a recipe for disaster. Disease was rampant. Cholera and typhoid fever, both directly related to polluted water, were epidemic. 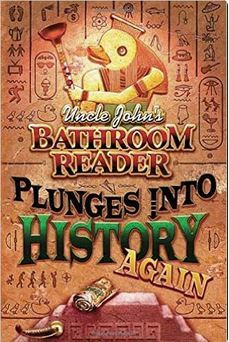 And with so many people suffering from diarrhea, the sewer system was even more taxed. It got so bad that waste would seep back into houses through cracks in the floors and walls. People were dying at a rate close to that of the plague. By 1858, The Year of the Great Stink, 30,000 Londoners had died as a result of three cholera epidemics alone. An engineer, Sir Joseph Bazalgette, had a vision. He proposed a system of interlocking underground sewers, complete with pumping stations and holding tanks. Government officials, who’d previously ignored him, realized that something had to be done. They gave the go-ahead, and 82 miles (132 km) of sewers were built. The new sewers reversed the pollution in the Thames. Fish made their way back to the river, the air became breathable, and illness declined. Today, the Thames is considered one of the cleanest major bodies of water in all Europe, and Bazalgette’s sewers, now nearly 150 years old, are still in use.